Wangechi Mutu: The Hybrid Human is an exhibition of prints and sculpture including complete sets of two series of prints: Histology of the Different Classes of Uterine Tumors from 2006, and The Original Nine Daughters from 2012. In Histology of the Different Classes of Uterine Tumors, Mutu builds upon the pages of a Victorian medical diagram to create portraits and masks that are powerfully alluring in their futuristic aura and at times frightful with a primordial feel. This is Wangechi Mutu’s first solo exhibition in the Pacific Northwest and the inaugural exhibition in the annual Jordan D. Schnitzer Exhibition and Visiting Artist Series.The Jordan D. Schnitzer Exhibition and Visiting Artist Lecture Series presents an annual curated exhibition from the dynamic and expansive collection of more than 9,000 contemporary prints of Jordan D. Schnitzer and the Jordan Schnitzer Family Foundation at the Pacific Northwest College of Art 511 Gallery. The series brings an invited artist in connection to the exhibition to engage with PNCA students, faculty, and the public through lectures, studio visits, and collaborations with the MFA in Print Media program. In addition to the Exhibition and Visiting Artist Series, selections from the Collection will be lent to the PNCA Object Library to be studied by students and faculty on a regular rotating basis. Wangechi Mutu presents an artist’s talk on March 10, 2016, at 6:30pm at PNCA’s Arlene and Harold Schnitzer Center for Art and Design. 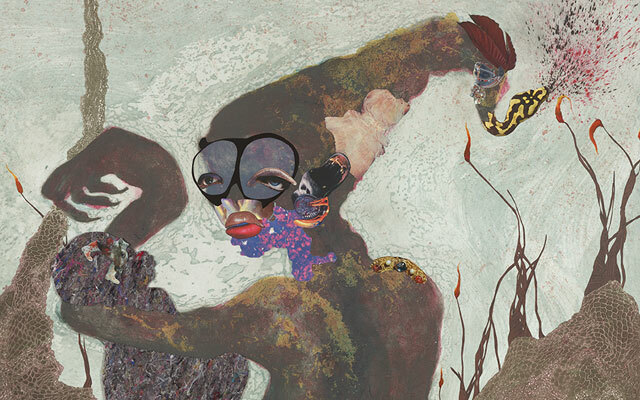 Wangechi Mutu: The Hybrid Human is co-presented with the Jordan Schnitzer Family Foundation, PNCA’s MFA Print Media, and MFA Visual Studies Departments.